The Akafugu Nixie Clock is a fun to build stylish clock kit that uses old-fashioned neon Nixie tubes. The project based on Atmega328P microcontroller with Arduino bootloader and firmware preloadedIt comes with Selectable RGB backlight for the tubes. It has 3 PCB modular design with a unique look that incorporates the PCB board into the case: The front and back panel are PCB boards, with smoke black acrylic lining the sides. 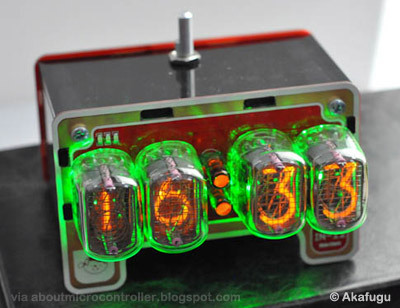 The result is a strikingly simple and compact Nixie clock that combines modern and retro looks. The clock is controlled and set using an innovative method involving a single push-button rotary controller and three indicator LEDs on the display board.